"Max Goes to Jupiter" (Big Kid Science, 2018) by Jeffrey Bennett, Nick Schneider and Erica Ellingson and illustrated by Michael Carroll. What does it take to land a Rottweiler on one of Jupiter's moons? Quite a lot, actually. Even a fictional sojourn to Io and Europa requires at least three authors, an illustrator, a handful of human reference models (plus a canine one) and nearly a dozen scientific and technical advisers, including a couple from the Jet Propulsion Laboratory. 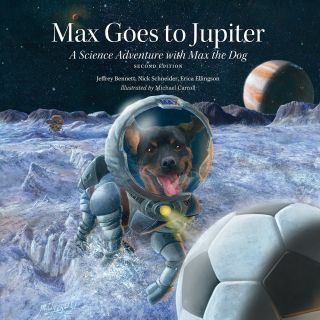 In the updated edition of "Max Goes to Jupiter" (Big Kid Science, 2018), written by Jeffrey Bennett, Nick Schneider and Erica Ellingson and illustrated by Michael Carroll, the "grandpuppy" of the original dog Max from "Max Goes to the Moon" (Big Kid Science, originally published 2003, updated in 2013) and "Max Goes to Mars" (Big Kid Science, originally published 2006, updated in 2015) steps into his namesake's space boots, both literally and figuratively. Max and his humans arrive at Jupiter in "Max Goes to Jupiter." Accompanying the main narrative on each page are what Bennett, a former NASA scientist, calls "big kid boxes": science-focused sidebars, aimed at kids ages 9 and up, that elaborate on some of the behind-the-scenes concepts that the story introduces — the volcanoes on Io, for example, or the ocean scientists believe lies beneath Europa's icy crust. The boxes also allow kids to "grow" with the books, Bennett told Space.com. "When kids are very young, they might pay attention only to the story and the art, and as they get older, they can begin to read the 'big kid boxes' and learn the science at a much deeper level," he said. For parents and teachers, they provide answers to questions inquisitive tots might ask as the story is being read. It's these sections that have been revised to accommodate findings from NASA's ongoing Juno mission. Each data-collection flyby by the Juno spacecraft brought about what Scott Bolton, Juno's principal investigator, has called a "fire hose of Jovian science." Visiting Jupiter means visiting its neighborhood, too — including the icy moon Europa — in "Max Goes to Jupiter." There was a second impetus to the update, too. Since Big Kid Science books was adding a revised Spanish edition of "Max Goes to Jupiter," it only made sense to amend the English one as well. Now Max and his human compatriots are "fully up to date," just as they are in the moon and Mars books, Bennett said. Like all of the children's books he writes, Bennett likes to make sure that every page hits at least one of three themes — education, perspective and inspiration — and, ideally, all three at once. A fanciful visit to Europa in "Max Goes to Jupiter." "This means striving to teach educational and scientific content in a way that also leads to new perspectives, such as thinking about our own lives in a new way and inspires readers to imagine the amazing things they might do or see in the future," he said. One example, he said, is on Pages 14 and 15, which features Max's ship entering Jupiter's orbit. "There is science content in how the ship uses its engine to enter the orbit of Jupiter, a perspective shift in Earth appearing 'barely as large as a mote of dust' and inspiration in the multinational crew," Bennett said. The view of the cosmos (and Earth) from Jupiter in "Max Goes to Jupiter." Bennett isn't hung up on the specific facts about Jupiter his young readers may or may not absorb. What he's more concerned about is kids gaining an appreciation of science and exploration as a "vehicle for giving us new perspectives and for inspiring us to try to make this world a better place," he said. With all the information we've gleaned from the Cassini mission, Max might head to Saturn next. Or perhaps Pluto, now that we know more about the erstwhile planet, thanks to New Horizons. For Bennett, however, his favorite celestial body is the one that remains beneath his feet. "We can learn a lot from other planets," he said, "but those lessons are most important in how they help us take better care of our home planet." Earth is the only planet with kibble, after all.